There are two kinds of Kitchen Tongs. One type is made from two pieces of heavy wire joined like scissors; the other is two pieces of light metal joined at the end, usually with a spring as well. That being said, the material doesn’t have to be metal: it can be metal and plastic, plastic, wood or bamboo. Plastic ones are fine for salads, buffets, salad bars, etc. Kitchen Tongs come in different lengths. Long-handled ones are particularly important when cooking over an open flame or splattering grease, because they mean your hands don’t need to come near danger. Scissor-type ones are fine for smaller pieces of food. To use them, you have to slide one finger through a hole in one of the handles, as you do for scissors. 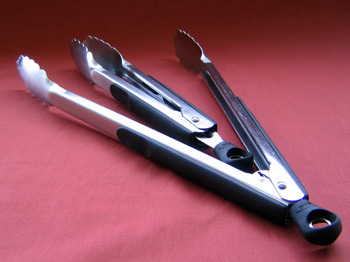 Tongs whose “holding ends” have scalloped food-gripping parts can allow a more stable grip when lifting large items. For non-stick pans, you can get metal tongs that have plastic non-stick coating on the food-gripping parts, or nylon heads. 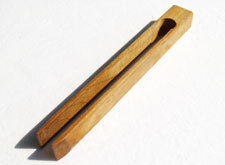 Or, you can use wooden tongs. When purchasing Kitchen Tongs, you may wish to consider choosing a pair that can be locked tightly closed when not in use, to reduce the storage tangle that can be encountered otherwise in drawers or crocks. Some have a sliding ring that locks them, some have a locking mechanism at the end that you pull to lock, push to unlock. Some people reserve Kitchen Tongs just for outside use, on the grill, but you may wish to get a few pair for the kitchen as well. Tongs are very useful for turning meat such as sausages, pork chops, and steaks. Using a fork to turn meat involves piercing the meat, allowing the juices to flow out and evaporate, leaving the meat drier. As well, tongs eliminate chasing breakfast sausages around a frying pan with an egg-flipper or a fork. metal ones can be used for turning larger items being deep-fried such as battered food, onions rings, etc. There are also specialized tongs for specialized purposes. While you’re cooking something and using tongs, don’t rest the tongs against a hot pan. If the tongs have metal handles, you’ll heat up the handles and possibly burn yourself; if the tongs have wooden handles, you may burn them; if they have plastic handles, you may melt them.